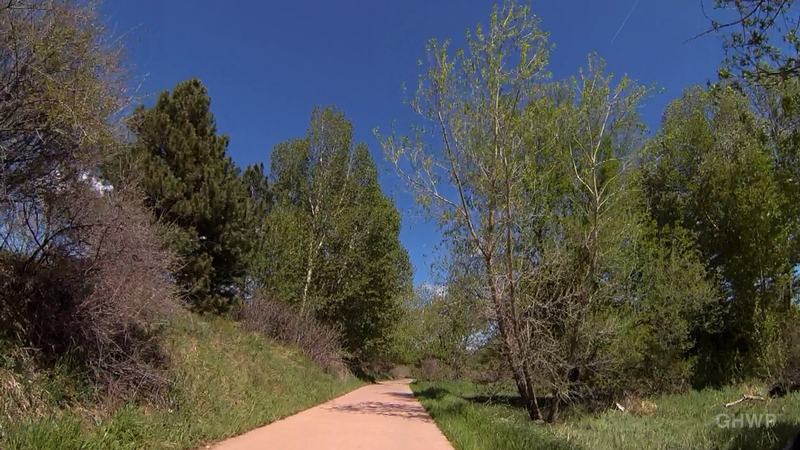 Fort Collins, Colorado, features five major biking, pedestrian and horseback riding trails: the Poudre, Spring Creek, Fossil Creek, Power and Mason Trails. These inviting trails make it a pleasure to cut from one end of town to the other - avoiding streets while enjoying the views of creeks, ponds, meadows, parks and wildlife. For this week's video, I rode a German-made vintage Sears bike (thank you, G.J.!) along the Spring Creek Trail from College Avenue heading east all the way to its end to the Cache la Poudre River and the Poudre Trail. I decided to experiment a bit with the GoPro Hero 3 (thank you, Pete!) to bring you a time-lapse video that would give you a quick and fun overview of that half of the trail. After having put the GoPro on a car mount and using the time-lapse function (a photo every second) for the "The Narrows, Poudre Canyon (Time Lapse) – In A Colorado Minute (Week 197)" video and then using the video function and putting the GoPro camera on my helmet for the "1st Time Skiing – Loveland Ski Area – In A Colorado Minute (Week 207)" video, I thought this time I would try the chest mount and let the camera record video, which I would speed up later. Yeah, not so happy with the result. Reminds me a lot of the "Riding across the Brooklyn Bridge – In A Brooklyn Minute (Week 84)" video. The bumpy trail, combined with a bike without shocks, my own movement and the rolling shutter of the camera, resulted in very bouncy, wobbly footage. Applying different filters and effects to smooth it out (mainly smooth cam), led to a rather chunky image. As I remind myself again that this web series is not about perfectionism, but about sharing moving images of a location or an event with you every single week, I'm happy to show you a non-perfect video highlighting one of the things that make Fort Collins such a great town: the trails and nature. Also it's another video that reminds me of what was going on at the time: you see my friend Erik speed past me in his "Slow - Biker At Play" shirt. Erik is visiting for a few weeks from Hamburg and has been riding all the town's trails during this time. The song in this video is called "Hook It Up" was written and performed by Jason Matherne, who just became a father again this weekend. Congratulations, Jason!! !